As one who does not find themselves using the word God in their vocabulary on a regular basis I first read the title of this book and wonder if the religious connotation may mean that the contents were based on ones religious views. I hesitantly began reading and found that I was soon wrong. This book is suitable for all regardless of beliefs or culture. What would you do if you were diagnosed with lung cancer and told you had a life expectancy of 6 months to 2 years? Once the shock, anger, rage and fear wore off would you accept your fate or seek all treatment possible hoping for a better outcome? The later is exactly what Jerry Smith did and today he lives to tell the story of his life, instilling hope and empowerment into others. As I read I realised that no matter what upbringing we have and no matter where we come from we can rise above our hardships and misfortunes and follow our dreams and happiness. It is often in hard times that we stop and reassess our life and outlook. When given his 'sentence of death' this was exactly what Jerry Smith did. When he looked back on his life he realised that he never really had a sense of purpose. He states that since writing this book his life has been a continued journey in which he explores new paths daily. 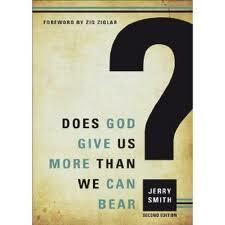 Does God Give Us More Than We Can Bear? by Jerry Smith is easy to read and, being smaller than the normal paperback, fits snuggly into the handbag or briefcase for reading at any location. It is not just a book but a book with a message that one man needed to tell and, being in its second edition, many needed to hear.